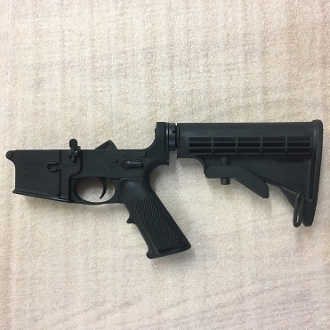 Complete 'mil spec' Ar-15 Semi-Auto assembled Lower Receiver. 6 Position mil-spec buffer tube and adjustable stock. This item uses an Anderson lower receiver and an Anderson lower parts kit. If you have any warranty concerns regarding the receiver or LPK (trigger, hammer, pins, etc) you must take them up with Anderson directly. If you have any concerns with the buffer tube assembly or stock, mid state will warranty that part. Note: This item requires shipment to a Licensed FFL dealer. You must provide a copy of the FFL license at time of order. EMAIL COPY OF FFL LICENSE TO MSFIREARMSLLC@GMAIL.COM , INCLUDE YOUR NAME AND ORDER NUMBER, PUT THE FFL ADDRESS AS THE SHIPPING ADDRESS. Note: If picking up locally, a $20 transfer fee will apply unlesss you have cc permit. Select I'm not ordering an upper in the same order as this lower.